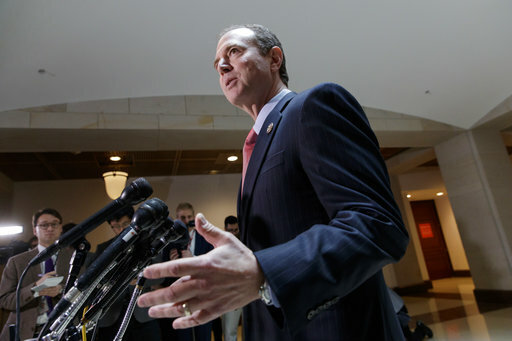 WASHINGTON (CN) – The top Democrat on the House Intelligence Committee said Thursday he has “profound concern” about how documents showing that President Donald Trump and his associates were incidentally included in foreign surveillance conducted by intelligence agencies ended up in the hands of the committee’s chairman. Rep. Adam Schiff’s comments came just hours after The New York Times reported that it was two White House national security officials who delivered the documents to Nunes, who has been lambasted in the past week for going to the president with information that could tie into the committee’s investigation into Russian interference in the 2016 election. The California Democrat questioned whether the White House was attempting to “launder” the information through committee chairman Rep. Devin Nunes, who last week announced he had discussed the documents with Trump at the White House without telling other members of the committee. “If that was designed to hide the origin of the materials, that raises profound questions about just what the White House is doing that need to be answered,” Schiff told reporters at a press conference Thursday afternoon. He also wondered why the White House officials would not just go directly to the president with the information, instead of going through Nunes. The White House sent a letter on Thursday to Schiff and Nunes, as well as their counterparts on the Senate Intelligence Committee, inviting them to the White House to review documents related to the incidental collection of Trump communications. At his daily press briefing on Thursday, Press Secretary Sean Spicer would not say whether the information the committee members are invited to review is the same batch of documents Nunes talked about last week. Schiff was not clear on this point either, but said he is “more than willing” to go the White House to look over the documents. However, he said it would likely be necessary for the full committee to have the same privilege in order to figure out if the collection and dissemination of the communication was appropriate. In the wake of the news Nunes viewed the documents on White House grounds, Schiff called for Nunes to recuse himself from the investigation. He reiterated on Thursday his belief that the validity of the committee’s work is at stake. “There is no question that there is a cloud over the investigation as a result of the way the materials were provided if indeed we’re talking about the same documents here. But even amid the drama of the documents and Nunes’ sources, Schiff promised the committee would get to the heart of Russian interference in the presidential election.